A brochure for Westinghouse Electric's Power Generation Canadian Division, located in Hamilton, Canada. Since its founding in 1903, Westinghouse Canada, Inc. (WECAN) was an integral part of the Westinghouse Electric Company's engineering and manufacturing structure. Although WECAN was built to manufacture large rotating equipment, such as motors and both steam turbines and gas turbines, the facility also manufactured a broad spectrum of equipment. Original 21-page brochure: Private Collection of Harry L. Jaeger. Digital reproduction of original 21-page brochure. Originally published by Westinghouse Canada, Inc. Copyright to this resource is held by Westinghouse Canada, Inc. and is provided here by RICHES of Central Florida for educational purposes only. Manners, Sandy. Westinghouse, Siemens Westinghouse: 100 Years in Canada. Hamilton, Ont: Siemens Westinghouse, 2003. 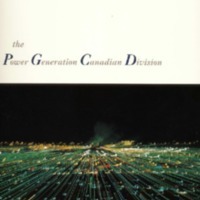 “The Power Generation Canadian Division.” RICHES of Central Florida accessed April 22, 2019, https://richesmi.cah.ucf.edu/omeka/items/show/7418.